While 4K Ultra HD, OLED, Curved Screen TVs, and HDR get all the hype on the video side of things at CES, on the audio side, Dolby Atmos and DTS:X are hogging the spotlight these days, but the quest for practical and affordable wireless speakers for use in the home theater environment (we're not talking about all those portable Bluetooth speakers) has been in the works for over a decade, with companies, such as Summit Wireless, and WiSA leading the way. Bang & Oflusen has had an impressive system available for over almost 2 years, but it is out of reach for most consumers' wallets. 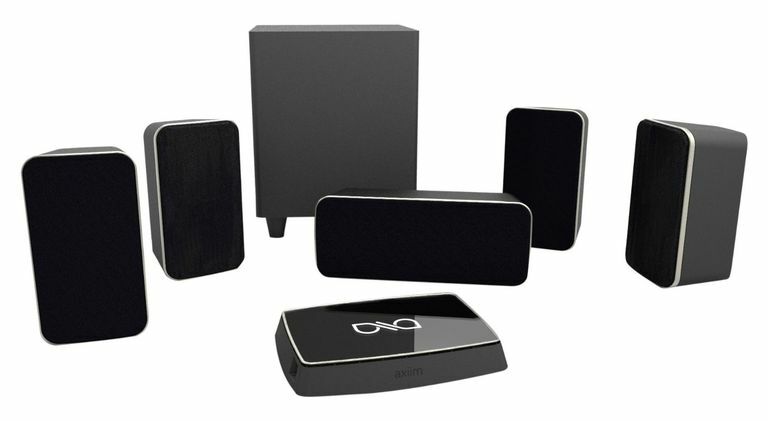 Enclave Audio offers a promising inexpensive home theater system featuring wireless speakers, Klipsch has brought their first wireless reference speakers to market, and a company that you may not be familiar with, Axiim, based in Kirkland, Washington, has also entered the market with their Axiim Q system. The Axiim Q is a complete home theater audio system, consisting of a central AV receiver with your choice of either a 5.1 or 7.1 speaker system. To start off, the Axiim Q AV receiver, although offering some of what a traditional home theater receiver, is also very much smaller. The reason for its compactness is that instead of housing all the amplifiers needed to power speakers, the amplifiers are actually placed inside the speakers. The receiver merely transmits the audio signals coming from the devices that are connected to it, wirelessly (up to 24bits at 96kHz employing standards established by Wisa) to the speakers and subwoofer. When setting the system up, each speaker is assignable to a specific channel. However, keep mind that although the speakers receive audio signals wirelessly from the Q AV receiver since each speaker (and subwoofer) houses its own amplifier, the speaker must still be connected to AC power via a cord (where is Nikola Tesla when you need him?). Onscreen Menu: Provided for setup, operation, and content access features. Audio Setup and Control: Speaker pairing and distance calibration, 10 band graphic equalizer and master volume. Audio Decoding: Built-in decoding for most Dolby and DTS surround formats including Dolby TrueHD And DTS-HD Master Audio. Video Support: Video resolutions up to 1080p (60fps) 2D or 3D. AV Inputs: 6 HDMI inputs, 4 USB connections, and eSATA Hardrive connectivity (supports Music Discovery on connected USB devices and eSATA hard drives). There are no digital optical/coaxial, or analog audio/video connections provided. Bluetooth: Direct Wireless streaming from compatible devices. Network Capability: Gigabit Ethernet and WiFi. Also, allows firmware update via network. Remote Control: Bluetooth remote provided, IR port provided for use with IR-based universal remote controls. iOS and Android remote control apps are expected to become available. Dimensions (HxWxD): 1.8 x 11.3 x 8.1 in. (45 x 287 x 207 mm). Weight: 2.54 lbs (1.15 kg). Power Supply: 100-240VAC, 50/60Hz, Less than 13W. The speakers used in the system are the axiim XM.4211CS (Center Channel), XM.4111SS (main and surround channels, and the XM.101SW (subwoofer). Amplifier Characteristics: Acoustically matched 3-channel high-efficiency Class-D digital power amplifier (Power output specs forthcoming). Wireless Audio Reception: WiSA compliant, 24bit/96kHz. Speaker Drivers: One 1 in. (25 mm) fabric dome Tweeter, Dual 4-inch Mid-range/woofers. Dimensions (HxWxD): 5.8 x 14.1 x 5.7 in. (147 x 358 x 145 mm). Weight: 7.45 lbs (3.39 kg). Amplifier Characteristics: Acoustically matched 2-channel high-efficiency Class D digital power amplifier (Power output specs forthcoming). Speaker Drivers: One 1 in. (25 mm) fabric dome Tweeter, One 4-inch Mid-range/woofers. Dimensions (HxWxD): 10.6 x 5.7 x 5.7 in. (270 x 145 x 145 mm). Weight: 5.30 lbs (2.41 kg). Amplifier Characteristics: Acoustically matched high-efficiency Class-D digital power amplifier (Power output specs forthcoming). Speaker Driver: One 10 inch driver. Dimensions (HxWxD): 15.9 x 12.5 x 12.5 in. (405 x 318 x 318 mm). Weight: 34.2 lbs (15.5 kg). Now, if Axiim can come up with a Dolby Atmos compatible wireless home theater audio system and speakers — that would raise the performance and application bar a little higher. However, wireless home theater audio systems and speakers from Klipsch and Axiim are successful, this could be a real game changer for home theater audio — no more speaker wire clutter.